Before taking a Linux certification, you need to decide which distribution you need to get familiar with (they are a lot of Linux distributions). Depending on the kind of certification, your choice will not be the same. The versions of distribution shown here can change without notice. It stands for Red Hat Enterprise Linux 7. This is the official Red Hat distribution. This distribution follows a life cycle policy and a roadmap. For a subscription fee, you get support and regular patches. It means Community ENTerprise Operating System 7. This distribution takes the sources from the RHEL 7distribution, remove the Red Hat trademarks, adds drivers into the kernel, increasing the list of supported hardwares, and recompiles everything. Unlike the RHEL 7 distribution which is mainly version driven, the CentOS 7 distribution integrates packages when they are available upstream; for this reason, the Centos 7 distribution uses dates in its name; for example, CentOS 7 (1511) aka CentOS 7.2 includes packages released up to November 2015. There is no fees associated with the use of this distribution. Before 2014, the team behind CentOS was essentially a group of volunteers with no direct connection with Red Hat. Since 2014, the situation has changed: several people of the CentOS team are now Red Hat employees. 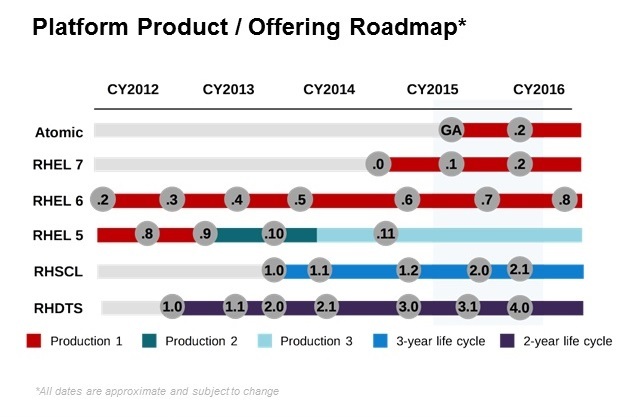 Red Hat sees this distribution like an entry point for individuals or companies with limited budget, expecting them to move to RHEL 7 for serious business. Red Hat doesn’t provide any support for this distribution. This is a distribution sponsored by Fermilab. Except the lack of direct connection with Red Hat, this distribution is very similar to CentOS. Its main purpose is to provide “a stable platform for scientific computing that anyone can use”. It stands for Oracle Enterprise Linux 7. This distribution is open source and based on RHEL 7. Oracle provides two different kernels: a standard Red Hat kernel and an optimized Oracle kernel. For a subscription fee, you get support and regular patches. Oracle has integrated a technology of dynamic kernel patching into its distribution. Another distribution called Fedora (this is a type of hat!) exists but is not really a good option from a certification point of view. This distribution is the cutting-edge Red Hat distribution allowing proof of concept of new technologies. Commands, syntax, options will be slightly different and will increase the level of difficulty when preparing exams. However, it makes sense to install a Fedora distribution if you want to learn new concepts even before there are integrated into the major distributions or if you want to get very recent packages on the client side (graphics, user interface, etc). You can watch Joe Brockmeier from Red Hat explaining the differences between Fedora, RHEL & CentOS (4min/2015) or read this article about the relationship between Fedora and RHEL. RHEL Atomic is a distribution based on RHEL 7 created for managing containers with minimal maintenance overhead: no yum command, no GUI and a reduced number of packages. It is definitively not a learning environment. CentOS 7 is the best option in most of the cases. to get some help from the Red Hat support. Scientific Linux 7 makes sense if your professional environment uses it. Oracle Linux 7 is only an option if your interest is geared towards Oracle databases. Amazon Linux AMI (Amazon Machine Image) is currently based on CentOSbut doesn’t seem to be a good choice for exam preparation (see discussion about the pros and cons of Amazon Linux vs RHEL/CentOS). This distribution is opensource and supported by Suse. This distribution is based on Debian, open source and supported by Canonical. If you come from a Solaris background, Oracle provides a page describing the differences between RHEL and Solaris 11 distributions. You can also watch a RedHat video called What is a Linux distribution? (10min/2017).